We have noted the continued concern from members of the expat community in Siem Reap, Cambodia, about a ‘Milk Scam’ run by some beggars in the city center. 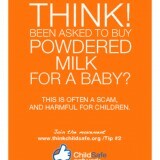 Instead of asking for money they ask tourists to buy powdered milk for their child. In the scam, the shop selling the milk are ‘in’ on this, and the milk is sold back to them by the beggar , so both the beggar and the business make money from the unsuspecting tourist. A serious concern of many is that the babies involved in this scam appear to be drugged to make the situation look bad and generate more sympathy (and a sale) from the tourists. The Friends Kaliyan Mith (KM) team in Siem Reap have looked into this allegation before, and also sought information from other NGOs (Mith Samlanh in Phnom Penh, M’Lop T’Pang in Sihanoukville, and Komar Rikreay in Battambang), the Angkor Hospital for Children in Siem Reap and UNICEF. None were able to provide any examples of firm evidence or even hearsay that the babies being used for begging were drugged. In August the KM Outreach team went “undercover” for a few days in the city center to observe the situation with the begging babies. Again, no evidence was found that these babies are drugged. The KM Drop-in Center (DIC) is very close to where the begging baby scam is based, so KM will continue via both outreach social workers and the DIC to engage with this group of women. Friends-International 3PC Program Review & Looking To The Future! Thanks for commenting. The difficulty many face when visiting a developing country for the first time is a total lack of knowledge or understanding about situations such as these, and a response is often emotionally driven ‘in the moment’. This why we developed our 7 Tips for Travelers, to allow travelers to think about the consequences of their actions. By sharing the messages, and in this case with a very specific focus on this particular scam, we can help to educate travelers and bring an end to these practices. I live here for part of the year and in the last two days, I’ve intervened twice when I saw tourists being drawn into this scam by the same boy. Yesterday, I was met with a string of curse words, today, with nasty pinches on my arm and threats of murder. I’m not so worried that a 9 year old will murder me (although I’ve been told that his handlers might want to if I keep this up,). But I don’t want to sit idly by when I see the children and visitors being exploited by this scam. What do you recommend that folks like me do in the moment when we witness this scam taking place. Is there a way to support the kids in the process by alerting one of the local NGOs that work with street kids? Should we inform potential “victims” or just keep our distance? Hi Allison – we don’t recommend you place yourself in any danger in attempting to address this issue. 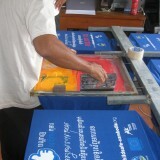 Perhaps you know of places which would be happy to display our THINK materials and help educate tourists on the scam? If you email childsafe@friends-international.org they can provide resources for you. If you have any immediate concerns about the children, please do call the ChildSafe Hotline on 017 358 758 and they can intervene. I have lived in Asia three decades and am no stranger to street scams. Still I fell for this milk ploy in Kathmandu a few years ago… except I suspected something and after purchasing the powder (a much smaller bag than the large tin I was asked to get), I cut the bag open before giving it to the woman so it could not be resold. Only later was my suspicion confirmed. It’s all hard because it’s so heartbreaking.